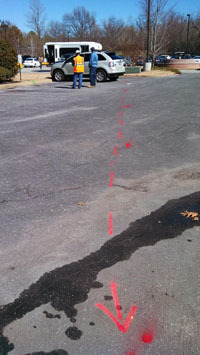 Ground Penetrating Radar Systems of Tennessee was able to work with a contractor in Jackson, TN to scan at a local office for underground utilities before ground disturbing activities. GPRS uses non-destructive testing equipment to locate piping, power-lines, underground storage tanks, and grave sites that are unable to be seen. Using GPRS is a safe, cost effective way to make sure you can safely drill or dig and not destroy any underground utilities or determine if USTs do or do not exist on a property. Other services we offer are: Post-Tension Cable Location, Conduit Locating, Rebar Locating, Void Location and more. If GPR services are needed in Memphis, call Casey Barefield at (901) 233-9964 or email at casey.barefield@gprsinc.com.